Rear Trailing Arm Bushing Set for BMW E36, E46, Z4. The stock rear trailing arm bushings (RTAB) deflect allowing the rear trailing arms to move – creating geometry variations which adversely affect the rear end. 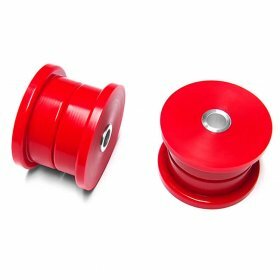 Our hard 75D durometer polyurethane rear trailing arm bushings (RTAB) hold the rear trailing arms firmly in place to virtually eliminate geometry changes, keeping alignment and handling consistent. Our unique bushing design incorporates grease grooves for easy lubrication. These extremely hard race-spec 75D durometer polyurethane rear trailing arm bushings are the hardest available (aside from solid aluminum) and the best option for race classes where solid bushings are not allowed, or for those who do not wish to deal with the issues that may arise when using solid metal bushings. Made of our exclusive U.S. Military Spec polyurethane (75D hardness) with aluminum sleeves. Set of two. Engineered for a perfect fit. Read why our polyurethane bushings are the highest quality bushings available.